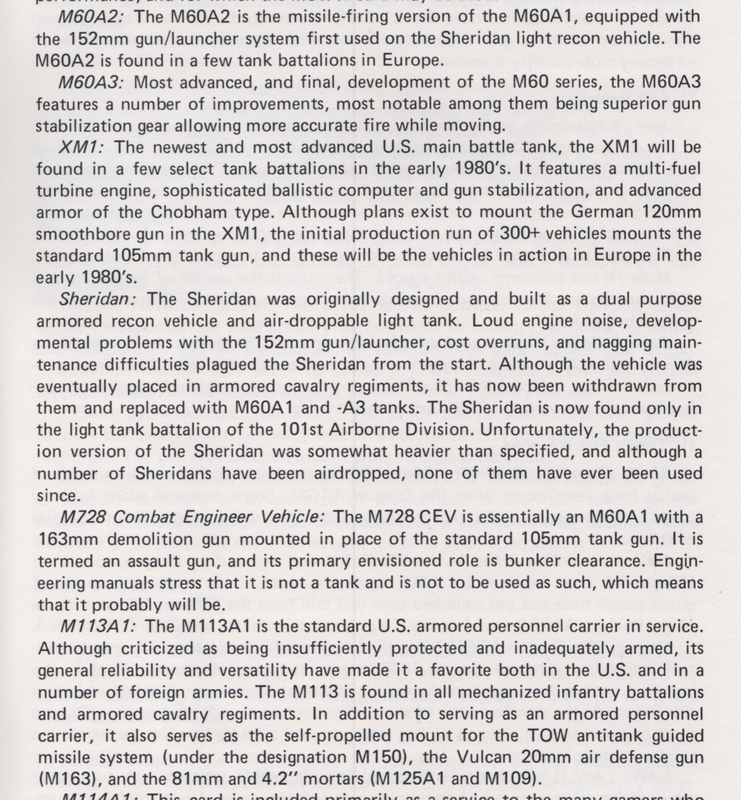 A player that is new to TAC II asked me if I had a document that lists all the vehicles with detailed short descriptions of them like what was in TACFORCE, Book 2 (see attached image). I do not have anything like that but I think it would something nice to have for newer players or players that are not familiar with all the latest modern vehicles and their capabilities. So, what I was thinking is that if any of you have a little time on your hands and want write up some short vehicle descriptions, about one paragraph long, and then send them to me, I’ll start putting together a document that includes all of them. This document will be something that continues to grow over time so there is no need to worry about doing all the vehicles at one time. So, if you’d like to help with this, please go to the Vehicle Data Card page and pick a few vehicles that you’d like to write up. Not too many, this should be a chore. You can pick more later. Look at the page I’ve scanned from the original TACFORCE manual to get an idea of what a short description should look like. Most of the info you need can be found on Wikipedia, but avoid simply cutting and pasting from the site, try to use your own words a bit to make it more personal. When you get a few done, email your document to me at allen@gcmini.com and I’ll start compiling the master document. Leave a reply on this post below telling others which ones you’ll be doing so that they do not double up on the ones you have picked.